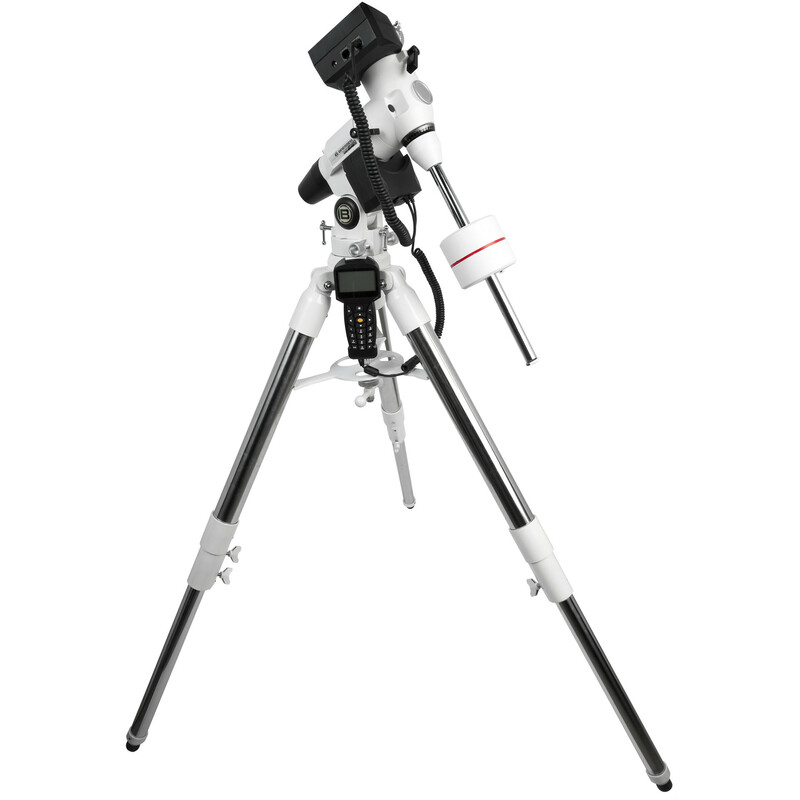 Explore Scientific put their FirstLight 127mm f/9.4 Achromatic GoTo Refractor with EXOS-2GT Mount includes a tripod and observing accessories to provide users with a complete observational package ideal for exploring the Moon and planets within our solar system, with the capability to reach out to bright deep-sky subjects such as star clusters, galaxies, and nebulae. 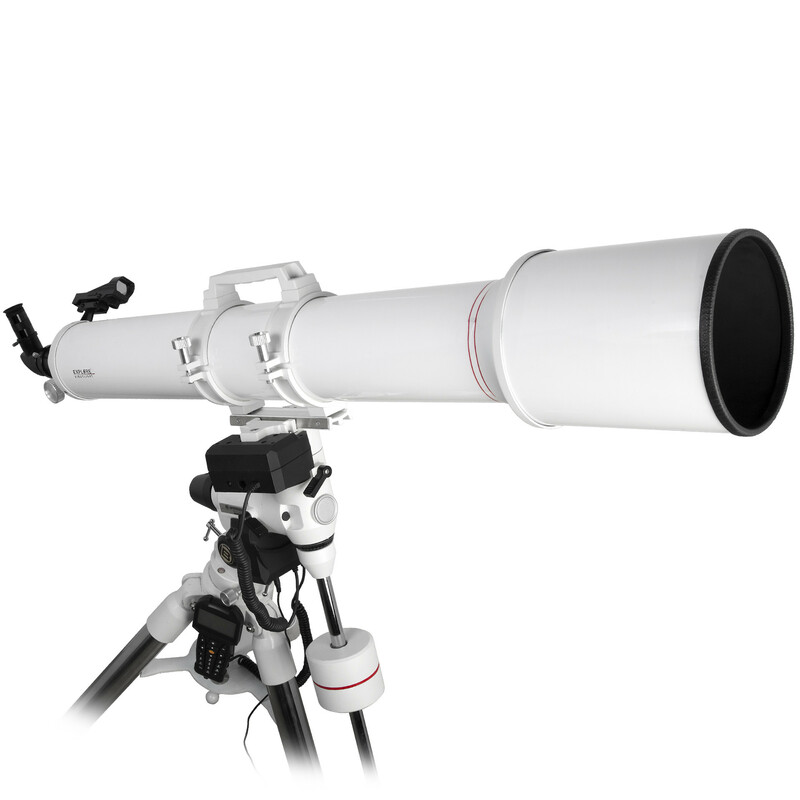 The refractor-style optical tube has a large 127mm (5") aperture configured with an achromatic lens system to correct chromatic and spherical aberration which translates to crisp and clear images with true color rendition with little distortion at the edges. Complementing this optical configuration, are fully multi-coated optics that increase light transmission to allow users to see distant objects better and increase details of objects within the solar system. The SkyTracker kit includes the hand controller unit, and right ascension and declination motors. Its hand controller has a database of more than 272,000 objects with the ability for users to input custom coordinates and favorites. With a slew speed of 2Â°/second and nine tracking speeds the SkyTracker can accurately keep near and deep sky objects such as the Moon, planets, galaxies, and nebulae centered in your eyepiece for long exposure imaging and astrophotography or prolonged observation sessions. The tripod is built with large 2" diameter stainless steel legs and tight tolerances to reduce vibration for clearer viewing. A center stabilizer bar pulls the accessory tray up to lock the legs in place adding further rigidity and vibration reduction. It is adjustable from 26.8 to 42.5" to accommodate a wide range of users and features large thumbscrews for tool-free adjustment in the field. An adjustable tray is also included with the tripod to keep eyepieces, flashlights, and other accessories safe and at the ready. Rounding out the included accessories is a 25mm eyepiece, a 90Â° star diagonal for comfortable viewing, a universal smartphone holder for capturing images through the eyepiece, and an unmagnified red-dot finder.